A platypus can’t figure out where she fits among the other animals in this offbeat rhyming tale of self-acceptance by debut author Tran with co-illustrator Swaschnig. 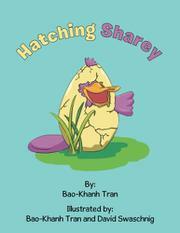 A purple platypus baby cracks through a golden eggshell and waddles to a puddle to look at her reflection. Seeing her bill, she wonders if she belongs with the duck swimming nearby. But the duck has no interest in her. Downcast, the platypus digs a tunnel and encounters a mole. Could this be her family? No, the mole can’t even see aboveground. When the platypus sees a beaver’s tail, she’s no longer hopeful. But the beaver sees her potential, calling her an “interesting creature!” She teaches her to build structures and calls her Sharey, because she shares other animals’ features. Sharey starts to enjoy her own strengths and uniqueness. Tran’s rhymes aren’t presented in stanzas, so they can be difficult to scan, especially when there’s a change in rhythm. The message, however, is kinder than the one in “The Ugly Duckling,” as Sharey never goes through a transformation; she discovers that she has value just the way she is. Tran and Swaschnig’s brightly colored illustrations, featuring a cartoonish platypus, a snooty duck, and a sympathetic beaver, fit the text’s tone with spare compositions uncluttered by extra details. A helpful fable for libraries that caters to children with self-esteem issues.